Small trees, shrubs, medium & large trees ... all native species that belong in this environment. Tree (and shrub) sale pre-orders are due on Monday, March 19, going to Forrest Keeling on Tuesday. Sarah will be out of the office most of Wed, Thurs, and Friday. Pre-order, and the trees are $25. Shrubs are $20. You pay when you pick them up. Make your check to Keep Carbondale Beautiful. Cash or credit cards also accepted. Here are trees which we have ordered in the past. Contact KCB for more info. Bottlebrush Buckeye ... a large shade tree with excellent form. Famous for its prized syrup, ... fabulous fall color ... grows in a variety of soil types but prefers a rich, well-drained soil. Height: 60-75 feet. Spring Tree Sale will be March 24-25, in conjunction with Home & Garden Exposition at the SIU Arena. Carbondale Chamber will host the Home & Garden Exposition on March 28-29, 2015. Come out to the SIU Arena. From 9 am until 3 pm Saturday and from 12 until 4 pm Sunday, Keep Carbondale Beautiful will have dozens of NATIVE TREES for sale. Below is information on the trees we try to carry -- mostly natives that are recommended for our environment but are harder to find commercially. If you want something else that you don't see here, native or not, please get in touch and let us know. We will try to get it for you. We will have a selection of native SHRUBS, too, for $20 each. 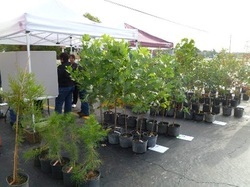 Keep Carbondale Beautiful trees will be sharing the space with Carbondale New School plants for sale at Auto Zone on Saturday May 3rd. The Carbondale New School Annual Plant Sale will be held Saturday May 3rd 2014, in the Autozone Parking Lot, 1028 E Walnut St, IL 13 East, Carbondale, IL, from 8am-12pm. Annuals, Herbs, Vegetables, and Beautiful Hanging Baskets will be on sale. Proceeds from the plants go to support Carbondale New School, a private, parent-owned school serving Pre-K through Eighth Grade. Please direct all questions to Amanda Sheridan, Director, at Carbondale New School, 618-457-4765. Keep Carbondale Beautiful will be at this sale with Native Trees. Pre-orders welcome. NB: Tree descriptions below are mainly from forrestkeeling.com, our other favorite source for native trees. Pre-order one of these trees by Monday noon (March 19) and save $5. Call 525-5525 or send e-mail to keepcb1326@gmail.com with the following information: Name, address, phone, email, tree selections. While supplies last. distinctive bark; good for rain gardens and erosion control -- prefers moist, well-drained soil, but tolerates dry; prefers deep, rich soils, but will grow in clay soils. Grow as single trunk or as a multi-stemmed tree. Height: 40-70 feet. Yellow buckeye is a medium to large deciduous tree that grows 50-75’ tall with an oblong-rounded crown. It is the largest of the buckeyes that are native to the U. S. Easily grown in average, medium moisture, well-drained soils in full sun to part shade. Prefers fertile, moist, humusy-sandy loams. Foliage tends to scorch and generally depreciate in dry conditions. This is a taprooted tree that once established is difficult to transplant. Keep America Beautiful says, "Planting a tree within 50 feet of a residence can increase its value by 9%." a large, majestic, and long-lived oak that holds year long interest. Our state tree in Illinois. Round-lobed leaves and smooth, medium-sized acorns. Height: 45-50 feet; can be as wide as it is tall. 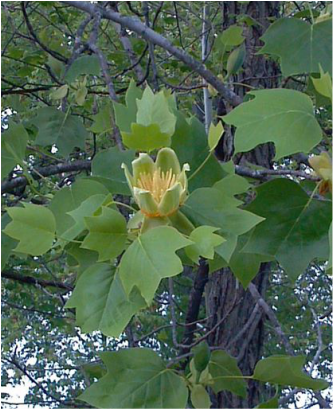 is a large tree with broad crown. Leaves turn varied shades in fall from bronze to red. has the largest acorns and leaves of all the oaks. Slow-growing and long-lived, it has a magnificent form in old age. Brown fall foliage persists all winter. Height: 50-60 feet. Give it plenty of room. Black Haw Viburnum has white spring flowers and, in the fall, leaves turn red. Purple-black fruit attracts birds. Grow as a multi-stemmed shrub or a round-headed tree.